The world needs banking but it does not need banks. 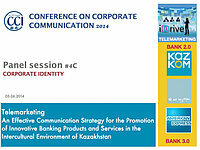 Purpose: The objective of this paper is to suggest telemarketing as one of Bank 2.0 tools for banks to efficiently apply communication strategies that proactively promote innovative banking products and services in the intercultural environment of Kazakhstan. Methodology: This research contribution derives from a comparative survey of literature and analysis of empirical results in relation to “business-to-customer telemarketing” as a communication strategy. This paper specifically focuses on corporate communication strategies to optimize Kazkommertsbank’s retail banking innovation, in order to achieve financial results by using alternative channels to bank-consumer constructive relationships. Findings: Based on a comprehensive literature review as well as the concepts, theories, and empirical results in regard to telemarketing, this paper shows how a telemarketing speech technique in corporate communication strategies can lead to asking and listening to customers about how they want to engage with the bank. Research implications: The introduced integrated business model may be used in practice as a pattern for effective promotion and testing of a set of innovative products and services, both in banking and different sectors. Practical applications: First, this paper presents the significance of using telemarketing as a communication strategy. Second, it focuses on service and training programs, which lead to financial success and decreased operating expenses. Third, it offers a new business model of communicative competence for corporate communication professionals seeking effective new ways of reaching, engaging, and communicating with customers. Singularity: The originality of the paper is a combination of its scientific approach and a practical realization of business objectives. 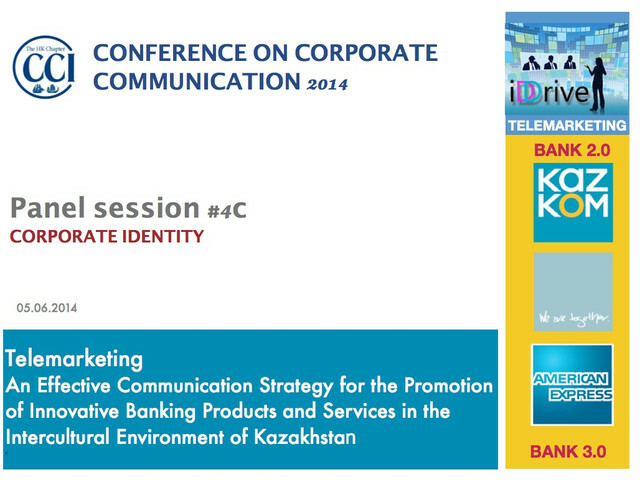 Keywords: Bank 2.0, telemarketing, communication strategy, business communicative competence, corporate training.